The boarded-up houses at Fourth and Calapooia as they looked on July 31. Mark and Tina Siegner have applied to the city for permission to demolish the three derelict houses at Fourth Avenue and Calapooia Street. In February, they bought the property for $85,000 from the Signs of Victory Mission. The Albany Planning Division issued a public notice of the application to owners within 300 feet. The city’s Landmarks Advisory Commission will hold a public hearing at 6 p.m. Sept. 5 in the City Hall council chamber. The structures, on a single tax lot, are in the Monteith Historic District, and the city describes them as “historic contributing.” According to county tax records, they were built from 1890 to 1910. The city condemned the dwellings as uninhabitable and boarded them up in November 2017. The Siegners own Valley Homes Inc., a construction company. 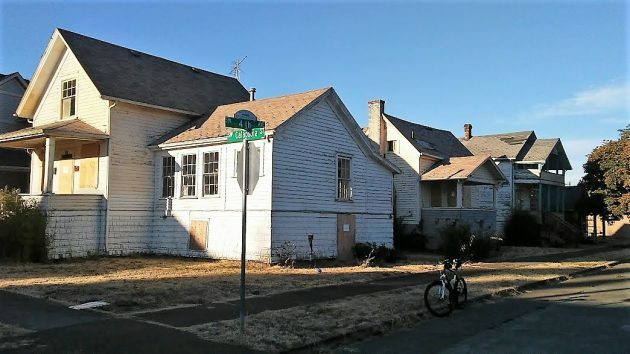 This spring they applied to CARA, the downtown urban renewal district, for $1 million in financial toward the estimated $1.5 million cost of refurbishing the houses and building two apartments and four garages on a vacant part of the L-shaped lot. But the application was pulled from the agenda of the CARA advisory board’s April meeting. The houses were in such bad shape — trashed and infested with waste and vermin — that renovating them would require taking them down to the studs, the owners said in their CARA request. Some artifacts are interesting, some compelling. Unless these houses have architectural significance (other than age), or have an historical significance, they aren’t compelling. Saving everything may reflect a hoarding problem. Maybe the Stars at “Ask This Old House” could be convinced to contribute as the homes in question are historical in nature. Not sure why taking them down to the studs will cost 1.5 million. And they have historical significance, they are on the National Historic Register.